Peter stood at the window with his face pressed against the cold glass, watching snowflakes drifting gently downward through the brisk January air. "Everyone gets to go places but me," he mumbled through his squished lips. "Just because I'm the youngest, I NEVER get to do ANYthing special," he complained. 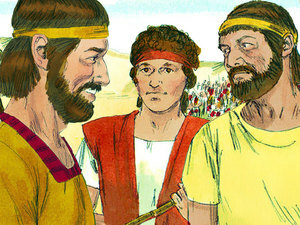 His three older brothers had taken off again on an outing with the youth group, leaving Peter behind as usual. David looked around at the scared faces surrounding him. Why was everyone so SCARED of this big bully? God was on their side, so why were they afraid? Goliath was making them look STUPID! And no one was doing ANYTHING! David had just come to see how his three older brothers were doing at the battle and was delivering food their father had sent. He thought he would get to see the soldiers fighting. But there, on the other side of the valley, stood a GREAT BIG GIANT. And, of course, no one wanted to fight him because he was just, well...just so BIG! 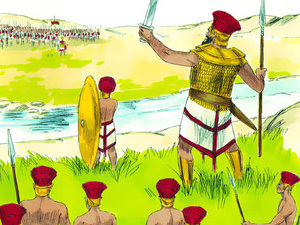 So his brothers and the rest of the Israelite army were just standing there, looking very, very scared. David wasn't impressed. Something had to be done! He walked up to one of the men and asked, "Excuse me, but isn't anyone going to fight that man?" The soldier looked down at him. "You mean Goliath?" David nodded. "Yes, is someone going to fight him or not?" "Are you kidding? He's too big!" the soldier replied. He'd crush our strongest men in a second! NO one's going to fight THAT giant." David stared at him with a smile. "Then I'LL fight him!" The man laughed, "Oh, you're just a boy! In fact, you should be going home now. Your brothers have their food, so go!" David turned around and walked away, trying to ignore the laughter and sneers of the crowd. So what if he WAS just a kid? God was on his side, too! But he did need to get home and it didn't seem like anyone was going to listen to him here. Just as he was about to leave the camp, a man came running up behind him. "Excuse me. Are you David?" he asked. "Yes, I am. Is there something wrong?" David asked him. "Just come with me, please," the man responded, taking David's arm gently. 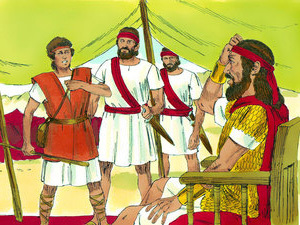 He took David to a large tent where inside sat King Saul on his royal throne. David stepped forward and respectfully asked, "Sir, you wanted to see me?" The king looked down at the small boy before him. "Uh, yes. Go fetch the man who said he wanted to fight Goliath." David smiled proudly. "That's me!" 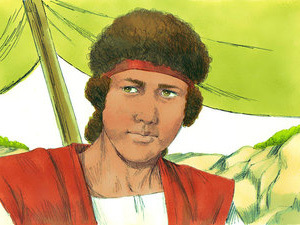 King Saul looked at him strangely, and David stopped smiling. "Is there something wrong, King Saul?" he asked timidly. "YES! YOU cannot fight Goliath! You are nothing but a small boy. He would crush you in an instant," King Saul bellowed. "But God is on my side, right? You don't have to worry, King. It'll be okay. I promise," David said. "Once, when I was watching my dad's sheep, a lion tried to eat one of the lambs. I killed it with my bare hands. Another time, a bear tried to eat some of my dad's sheep. I killed it, too." "If you must go, you will need armor," he said as he motioned for a guard to come over. "Go get my royal armor," he told the guard. 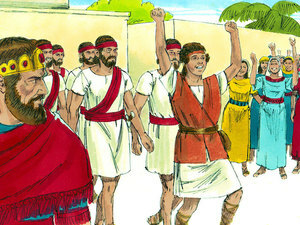 When he came back, King Saul commanded the guard to put it on David. David stood, or tried to stand, under all the armor. It was heavy. VERY heavy. "Um, King Saul?" David mumbled from underneath the suit of heavy armor. "Yes?" he answered, trying to place the sword in David's hand. CLANG! David dropped it. "This stuff is TOO heavy. I can't wear all this. I'll be fine without it, King Saul." 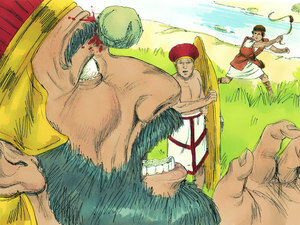 When he didn't seem convinced, David said, "King Saul, God is on my side. I'm not scared. Please let me go fight the giant." King Saul went back to his throne and sighed heavily. "All right. You may go," he said. "But please be careful. The Lord be with thee." David smiled, and as he walked out of the tent said, "THANKS!" He soon reached the valley where the giant was standing on the other side. David turned and saw a small brook. He walked over to it and picked up five smooth stones. He placed one into his leather slingshot and stepped closer to where the giant was. "What is this?" Goliath bellowed loudly. 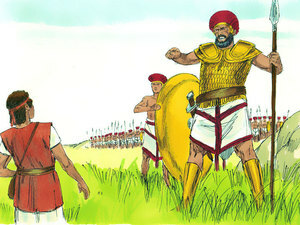 "The Israelites send me a BOY to fight? I will feed your skin to the birds!" David shivered at the thought, then straightened his back and lifted his chin. "But God is on my side. You can't hurt me! And I'm NOT scared!" 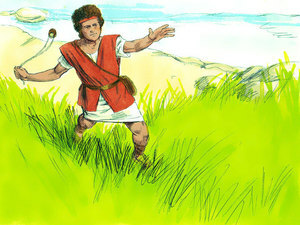 Goliath laughed and David began to swing his slingshot in the air slowly at first, then faster and faster. Goliath saw what he was trying to do and began walking towards him. Then SNAP!! David snapped the slingshot and the rock flew through the air, straight at Goliath's forehead, and WHAM!! David's eyes widened as the giant went cross-eyed for a moment, then fell over! He was dead and Israel was saved!! David had won the battle for the Israelites!! Don't tell God you have a big problem. Tell your problem you have a big God! Does our size really matter to God? Does He care if we're short or tall, fat or skinny? Could God use YOU to do something special for Him? Think of a time when you really needed God's help. my problems. In Jesus' Name. Amen. David & the Giant Beginners' Bible, My First I Can Read!